Which Hosting Company Should I Choose for My Business? The multitude of web hosting companies currently on the market can leave a business in search of a hosting provider overwhelmed by options, and often leads to a misinformed decision that can significantly impede the success of a business. Though all hosting companies provide servers that can meet the basic needs of site, each type of hosting server is defined by specific features, functions and in some cases, limitations. As you begin searching for a web hosting company, avoid the consequences of choosing an ill-suited server by learning more about what will work best for you and your business. For start-ups and smaller businesses with average web traffic and data needs, there are a number of reliable hosting options that can work well within a budget. One of the most effective and most popular hosting solutions for the small business is shared web hosting. Shared web hosting is a communal approach to utilizing a server that carries some limitations, but will work well if a small business anticipates remaining within set RAM capacity and disc space, and doesn’t foresee a need to change software. Plus, shared web hosting services usually provide users tools for website building and enhancement, which can be a definite advantage to the start-up looking for inspiration. Shared hosting also doesn’t require users to possess any advanced technical expertise, as all hosting maintenance and administrative tasks will be take care of by the shared hosting company. However, users will have access to a control panel (most of which have easy-to-use interfaces), where files and images can be uploaded and where users will find valuable site statistics. In general, shared web hosting is a highly cost-effective option that offers optimal convenience and beneficial start-up tools to get a website successfully up and running in a short amount of time. Reseller hosting can also serve to meet the hosting needs of a small business website. Choosing to work with a reseller (an individual who is selling his or her remaining shares of a server rented from a hosting company) can afford lower costs and typically offers the right amount of space for the average small business. Though a small business would depend on the individual reseller for overall server support (which may or may not be as reliable as the larger hosting company itself), reseller hosting can serve as a simplistic option for the small business just starting out. If your small business is interested in attaining a server from a large hosting provider directly, but your website will likely use less than what you’ll pay for, consider becoming a reseller yourself—a great option for the ambitious small business interested in earning extra cash flow. When a small business expands and begins to need additional hosting resources like RAM and disc space, it’s time to advance to a VPS (virtual private server) host, which is one of the most popular hosting choices for websites in general. The additional features and resources afforded from a VPS hosting service will also work perfectly for e-Commerce sites, forums and portals. VPS hosting also allows for greater user control and flexibility, which is perfect for the growing small business ready to install customized software or create multiple services with shell access. If your company is large in size and experiences or anticipates heavy web traffic and high data usage, there are definitely web hosting servers that will and will not work to your advantage. For a larger business, the main criteria for selecting a host should be securing every element of quality service. This includes fast uptime speeds, an absence of latency, guaranteed scalability and exceptional technical support. As mentioned, a shared web hosting service can be ideal for a smaller or mid-size business that will utilize resources like disk space and RAM that are within the hosting company’s limitations. However, if your business exceeds these resources, they’ll need to advance to a Virtual Private Server (discussed above), or move right along to the most advanced form of hosting: the dedicated server. 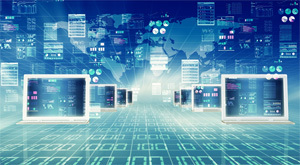 How do businesses know when they’ll be better off with a dedicated server? If your website traffic exceeds 100,000 visitors a day, it’s time to move up to a dedicated server. Dedicated servers are leased exclusively by a single client (in this case, a large company) and provide a greater degree of administrative control over elements like operating systems and hardware. Companies can expect to receive increased security (and are in general, less vulnerable), email system stability, greater bandwidth and faster speeds with a dedicated server. A large business can also pay for a managed dedicated server, which means the hosting provider will continue to tend to the upkeep of the server and resolve any technical problems should they arise. A managed dedicated server can be highly efficient and effective for the busy company with minimal knowledge of server operation. In addition, new technologies like cloud hosting and CDN (content delivery networks) can help a company accelerate websites through faster and more stable uptimes. Cloud hosting specifically can be perfect for the company with employees that work from remote locations with business that depends on collaboration and centralized storage of data. 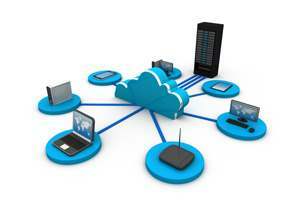 Cloud technology allows large companies to operate from a network of virtual servers that can be accessed without installing software on every employee computer. Many large companies also find that a cloud server’s flexible infrastructure and “pay as you go” policy are optimal for meeting the frequently-changing demands of business. Content delivery networks are in many ways considered a necessary addition to a website that receives international traffic, as CDNs significantly decrease latency, improve uptimes and enhance overall website performance for viewers regardless of their location. CDNs use various edge-servers in strategic geographic locations to decrease the distance content on a website travels from a server to a user’s browser. As slow upload speeds significantly influence whether a user remains on a page, it’s essential that companies evaluate the performance of their sites from all high traffic locations and implement content delivery networks when necessary. While cloud hosting and CDNs can cost more than other options, their dependable and scalable service will be worth the expense. Reliable email is crucial to the success of today’s business, as almost all of our internal and external communications are conducted not by phone, fax, or traditional mail, but through an email system. Given its increasing importance in the realm of business, it’s no surprise that many companies (both large and small) seek hosting servers that can more effectively accommodate email needs, rather than rely on the email system offered by an internet provider. Not only will a company likely get more dependable service from its own email server, it will benefit from elevated options for customization (like out of office automatic responses or an unlimited number of mailboxes). For large businesses in particular, it’s not unreasonable to argue that a server with capabilities for an exclusive email system is essential. Most types of hosting providers will offer packages that include options for email set-up.